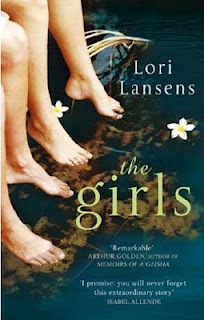 Lori Lansens begins The Girls: A Novel with a powerful but simple line: "I have never looked into my sister's eyes." Rose and Ruby Darlen are conjoined twins ~ attached at the side of the head, but each has a separate body and separate brain. They are as different as two sisters can be, yet together always. Born in the middle of a tornado to a mother who quickly fled the scene, the girls are taken in by a nurse who helped deliver them. Lovey and her husband Stash raise the girls to be as independent as they can be. The Girls is written from Rose's perspective, for the most part, as her memoir. Ruby adds a chapter here and there, usually beginning with "It's Ruby" and in a different font to set it apart from Rose's story. Rose wants to tell her life story, but as we learn from Ruby, there are certain details she isn't as interested in sharing. We hear about their experiences growing up on a farm, their life after the loss of their aunt and uncle, as they refer to Lovey and Stash, and many of the defining moments in their life. I have to admit when this was chosen as the next selection for my book club, I wasn't thrilled. I just didn't have a lot of interest in reading about conjoined twins, to be honest. But this novel is so much more. First of all, it reads like a memoir, which I loved. I kept having to remind myself that this was a work of fiction, not a true story. And second, it's really a story about two sisters, their relationship and their experiences, rather than a story about conjoined twins. Lansens digs deep into these two characters to the point that I felt like I knew them. And she made me care for them and the other characters in the story. I loved how she made the two girls so different ~ even their voices on the page, their writing styles, were dramatically different. I really enjoyed reading about Rose and Ruby, and was sad when the story ended. This review was written based on a copy of The Girls: A Novel that I borrowed from the library. This novel has always sounded so fascinating to me and I'm glad to hear it was! I actually just ordered it from B&N last week! I'm waiting for it to come in. What a great first line of the book too, wow! Fantastic review and a must read I think for me! I loved this book, and went on to read Lansens' The Wife's Tale which was also excellent! hi there directed here to read this review as it is on my MT TBR by Morning Meanderings. Delighted to have found you, I am now following so will be back for sure.